This time of year, is hunting season in Wyoming, and the state is known for its prime elk hunting. But after a series of conflicts with grizzly bears, outfitters and guides say there needs to be better grizzly management in the state. One morning this October, Bob Legasa and his hunting partner were heading down a hillside near Gardiner, Montana. They had spotted an elk herd the evening before, but then they encountered a different animal. "She pretty much charged straight on and almost like a football player tackling kind of paws out in the air, mouth wide open, and came at me," recalled Legasa. The elk hunters had encountered a grizzly sow and her cub. Legasa's hunting partner deployed bear spray, and after biting Legasa's arm and face, the bears ran off. His arm was broken and he had lacerations, but he was ok.
"I'm feeling pretty lucky with the amount of injuries that I've sustained," he said. But an outfitter earlier in the fall wasn't so lucky. In September, a guide from Jackson was killed by a grizzly. It's not unheard of for hunters and outfitters to encounter grizzlies while hunting. It's the time of year the animals are preparing to hibernate, so they're looking for food. Legasa has been elk hunting around Gardiner for about ten years. "Grizzlies have associated what's happening in hunting season. A gunshot is almost more of a magnet or a dinner bell," Legasa said. "They hear that and associate it with there's going to be a meal." Now, a group of scientist is studying interactions between grizzly bears and elk hunters in order to provide possible solutions to hunter-grizzly conflicts. "It seems it's very dependent on the context, late elk season might help reduce the number of conflicts versus an earlier elk season." Van Manen said human-grizzly conflicts and grizzly mortality usually spike during the hunting months , when there are more bears out and about. Taylor Engum owns East Fork Outfitters near Dubois. He said the presence of bears does make some hunters avoid the area. "I've had hunters that said, 'Yea, you're in a grizzly bear area. I'm not coming. I'm not going to hunt there'," said Engum. But is it hurting the business? The simple answer is no. Outfitters have been dealing with grizzlies for years. They know to take precautions on how camps are kept and how the meat is handled. 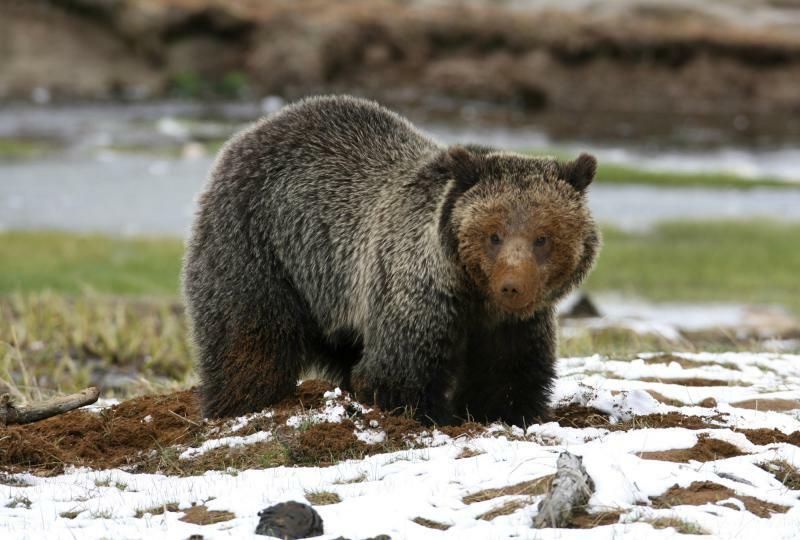 Sy Gilliland, the vice president of Wyoming Outfitters and Guide Association, said sure, grizzlies may keep some hunters away. "But you need to understand the absolute phenomenal demand for Wyoming elk hunting," said Gilliland. "It's unreal. It's as good as it's ever been and the sportsmen out there that know that, they will fill that void." But Engum said if the grizzly population continues to grow, there could be problems for the industry in the future. "The hunting pubic and people in Wyoming that spend time in the backcountry know how many bears there are and how healthy the population is," said Engum. "So, I think we should have a managed hunting season on these bears." Wyoming issued a hunting season this fall to manage the grizzly, but before the hunt could happen a federal district court judge put the Yellowstone ecosystem grizzly bear back under endangered species act protections. And the outfitter that was killed in September - that happened just two weeks after the hunt was put on hold. For now, management of the bear is back under the federal government. The Wyoming Game and Fish Department reports to the U.S. Fish and Wildlife Service on grizzly management. A lot of the information Game and Fish relays is from conversations with hunters and outfitters, but Gilliland said it still feels like a tug-a-war. That's frustrating to him, especially because outfitters are out in grizzly core habitat. "The industry has figured out how to live with the bear because we live with them more than anybody," said Gilliland. He said that level of interaction means outfitters and hunters should be taken seriously in the conversation about grizzly management. After a controversial year, the Yellowstone grizzlies are back on the Threatened Species List. The issue is frustrating to state officials because the state has to fund the majority of grizzly management. Since the last week of September when the grizzly bear returned to the federal threatened species list, there have been 15 grizzly mortalities. But are these numbers especially high? Eleven grizzly bears in the Greater Yellowstone ecosystem have been euthanized since the beginning of September in a "particularly bad month" for grizzly conflicts, the Powell Tribune in Wyoming reports. That rate may be normal for the fall.